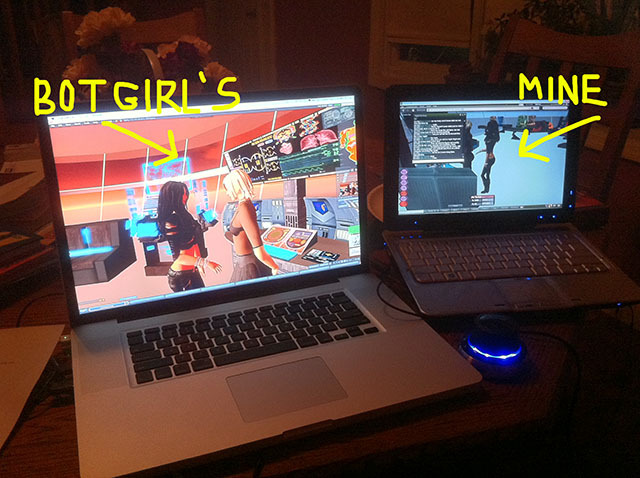 Majic and Botgirl's laptops for machinima shoot. Botgirl and Night were up all Saturday night working on their new video and asked me to help. I was excited at first because I thought they might have written a good part for me since Botgirl postponed the video we were supposed to make together. But she just wanted me to keep a chat window open so that her screen wouldn't be cluttered. Since Night was the one actually capturing the video I'm not sure why Botgirl needed my screen space. I guess as an alt I'm used to doing whatever she wants and being treated more like a beloved tool than an actual person. Anyway, I didn't really mind helping out but it was very boring. So boring that I decided to take some video myself. Since Botgirl postponed our project I decided that if I wanted to learn to make machinima I'd have to take matters into my own hands. So I decided to follow Hamlet's example and become an embedded journalist. Not in Blue Mars, but in Botgirl and Night's production. Here's my first video report. It's not really informative but it captured my experience of the shoot. We Won't Be Fooled Again seemed like a fitting background track for my mood. Assuming I'm not banned from the set, I'll be reporting on the rest of the project including voiceover sessions, editing, foley and special effects. If you want to get the non-alt view of the shoot, take a look at Night's post on her new blog. Oh yeah. Botgirl and Night want go give special thanks to brgn Halberstam from L+N Signature Designs for donating her remarkable SCORPIUS Steampunk ship to the project. See it and her other astounding creations inworld here.